Here is a map demonstrates territory of Russia. Displayed city Novorossiysk download for free. city Krymsk free download. city Anapa free download. You can find here city Temryuk free download. Displayed town Varenikovskaya for Garmin. You can find here town Anapskaya free download. On this map town Starotitarovskaya download for free. 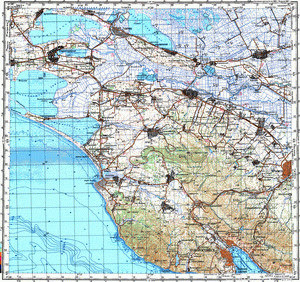 On this map town Anastasiyevskaya free download. On this map town Gostagayevskaya marked. Displayed town Rayevskaya presented. On this map town Gayduk presented. On this map town Verkhnebakanskiy presented. Displayed town Vityazevo presented. You can find here town Myskhako free download. On this map town Strelka marked. You can find here town Kiyevskoye free download. town Tsibanobalka presented.